Joe with team 1 (Holly, Sasha, Homer) at the start line. Along with Debby, Ty, Ron, Carolyn, Sandrina, Frank, and Roland. CSHC held its annual Calcutta rig race on Saturday, Nov. 17, 2012. This race is a fund raiser for the club. Mushers and musher wannabes have a chance to test their teams of 3 dogs on a short run (about 100 yards). 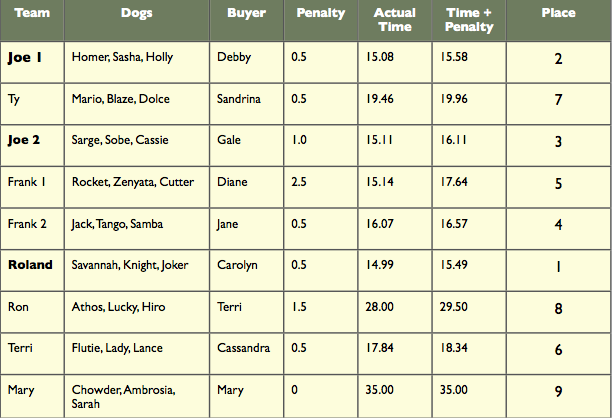 Teams are auctioned off and owners of the top 3 teams share half of the proceeds and the other half goes to the club. 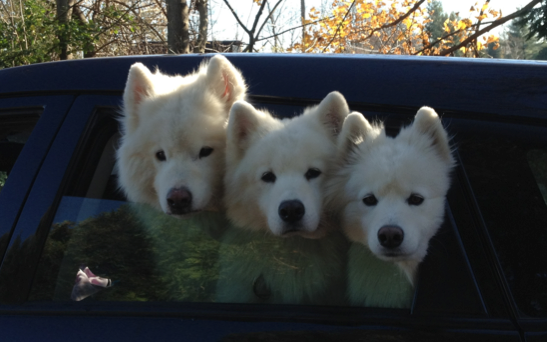 We had 9 teams running this year, including a team of Samoyeds from Baltimore. The Samoyed’s musher, Mary, had met some of our members the previous weekend at a mushing training camp in Pennsylvania. Winners of the 2012 race were Roland, Joe’s team no.1, Joe’s team no.2. 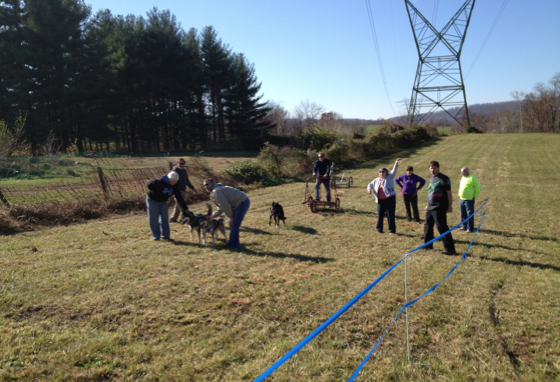 November 10 and 11 members of CSHC and their dogs went to a site near Altoona PA for a weekend of sled dog training. Those who went were Debby and Joe Fitzgerald, Diane and Frank Wright, Ron Gagne and Gene Smith. There were other mushers at the site with teams of Alaskans and Samoyeds. A variety of rigs, scooters and ATVs were used on the trails. One Sammy team of three were in a fan hitch pulling on a scooter. Most weekends in November and December club members train on the C & O Canal towpath. The Pennsylvania location was a change of pace and allowed for training not possible on the towpath. The owner of the site has created trails all over the 70 acre property. Joe described it as “Disneyland for mushers”. In addition to lots of trails and wide open spaces the site also features hills – something one definitely does not have on the towpath. Apparently running a team down hill with the training carts was too scary for some drivers. 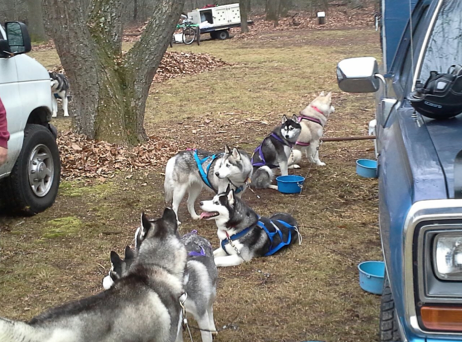 Debby said that all the dogs enjoyed the runs and everyone had fun talking to the other mushers.